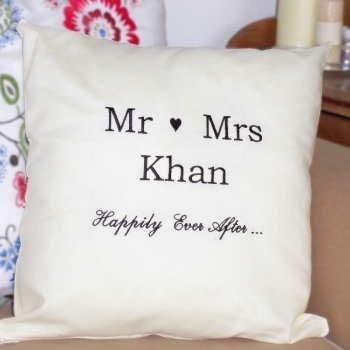 Beautiful personalised cotton cushion featuring the phrase Happily Ever After... and your chosen initials or names embroidered to commemorate a special occasion. Approx 41cm or 16 inch square 100% cotton cushion cover in a fabric colour of your choice. Approx 41cm or 16 inch square 100% cotton cushion cover in a fabric colour of your choice. Butter-cream, mocha-brown, red, pink or light sky blue, royal blue, black, dark green or purple available. Enter the name(s) you would like embroidered in your choice of thread colour.